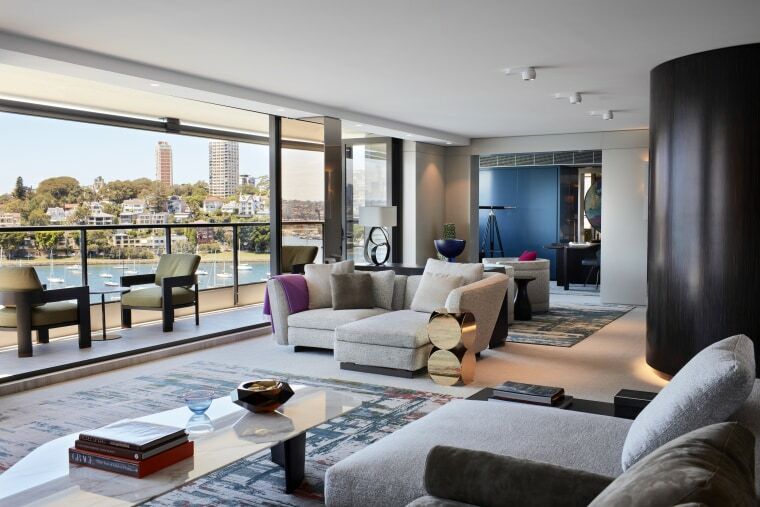 The homeowners were attracted to this substantial 1960’s harbour-side apartment in Sydney’s Elizabeth Bay for its spectacular location and substantial floor plate. However its highly ornate, rather tired interiors required a complete renovation. All of the existing walls, floors & ceilings were gutted leaving a bare shell so that an entirely new layout could be built - one that nonetheless used only the existing risers and outlets from the earlier layout as access to lower levels was impossible. Keen to capitalise on its immediate proximity to the shimmering beauty of Sydney Harbour, Archer Design developed a plan that opens this sizeable floor plate up to the views ensuring almost all rooms can enjoy a direct connection with the harbour. Even the Master Ensuite (previously a cramped, dark, internalised space) now enjoys expansive harbour views. This is enhanced by the use of custom designed, pivoting mirrors with integrated lighting. A generous layout of tranquil modernity was created , in which subtle luxury is effortlessly blended with relaxed, easy care comfort. This was paramount to the UK based owners as this apartment is their Sydney getaway, a welcome respite from their busy international lifestyle. In addition to opening up the apartment to capitalise on its elevated position, burnished bronzed mirrored wall panels are extensively employed to further dematerialise the walls and open up the apartment to its surroundings. Archer Design curated a substantial art collection especially for this apartment. Works by leading Australian and New Zealand artists were chosen with the owner to add further visual richness to the space and when placed over mirrored walls to appear to ‘float in space’ surrounded by the ever changing light of Sydney harbour. 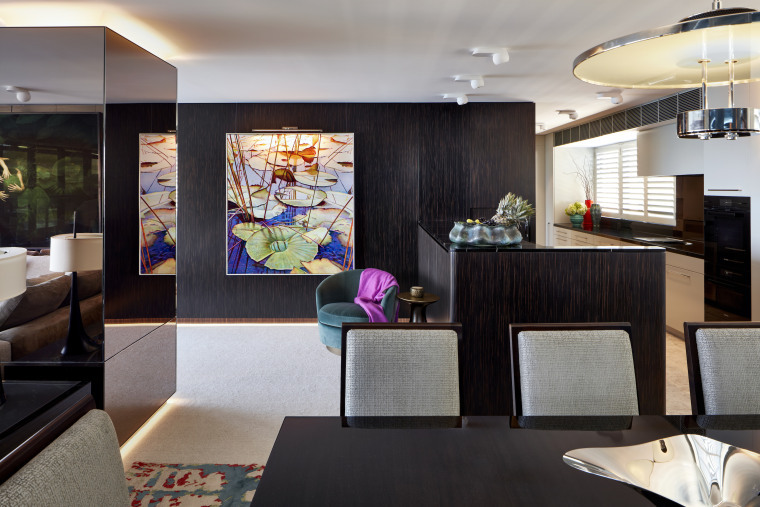 Throughout the apartment softly curving eucalypt & deep petroleum blue lacquered panels contrast with smooth ebony veneer and richly upholstered walls. This palette met the owners request for intense colouration and sumptuous materiality but one that never over powers the space or the view. Archer Design and their contractor, JMC Builders faced several challenges as the time frame allowed by the owners corporation was highly restrictive, and only one small lift was available (shared by other apartments) to transport all materials and tradespeople. All new architectural components were designed to be flat packed, scaled to fit inside the lift car and reassembled on site (including all mirrored wall panels, custom joinery units, bench tops and all of the new loose furniture, much of which was selected by the designers for its modularity as well as its comfort and style). As Archer Design and the owners met only during the very early phase of this highly detailed project, communication was limited almost entirely to emails and international phone calls. They provided a complete furnishing and fit out service so the owners first experienced their home with all furniture, bedding and homewares in place. All the homeowners needed to do was sit back and relax and enjoy their new home in this stunning location. They were thrilled with the finished result.